Winter has definitely arrived and with it, the risk of frostbite and hypothermia. Short-coated animals should not be left outside for extended periods of time in the winter – even on mild days. When taking short-coated dogs for walks in cold temperatures consider the use of jackets (that cover the belly, groin and armpits, where dogs have the most heat loss) and booties. Smaller animals, younger animals, ill animals and animals who have recently moved to a cold environment are at higher risk for frostbite. Body parts which have been previously frostbitten are at higher risk as well. Even cats with longer hair are not best equipped to handle the cold temperatures, even with shelter (they do not have a thick double coat like some breeds of dogs). The extremities; including ear tips, tail and paws, are at the highest risk for frostbite. Initially, a frostbitten extremity will feel cool to the touch and may look pale. After warming, the affected tissues will feel hot and look red. Hair loss and crusting may develop. Ear tips may curl. Eventually, if the frostbite is severe enough, the affected extremity may fall off. The severity of the injury may not be known for at least several days. Initial treatment involves slowly warming the affected tissue. Warm water or a warm compress is best. Make sure the water is not too hot. Never rub the affected tissue, as this may increase the tissue damage. Antibiotic ointments can be used if the area gets crusty to prevent infection. Pain medications may be required. Sometimes, amputation of the affected area may be advised. Hypothermia is low body temperature, which can occur due to prolonged exposure to cold weather. Animals with malnutrition, hypothyroidism, cardiac disease or very young or very old animals are at high risk for hypothermia. In untreated cases, organ failure can occur, which will result in death. that can then lead to coma and death. For mild hypothermia (where shivering is the only clinical sign) external rewarming is usually all that is required. For example, place the animal in a warm room, covered by a blanket or other insulating material. For severe hypothermia, immediate veterinary attention is required. 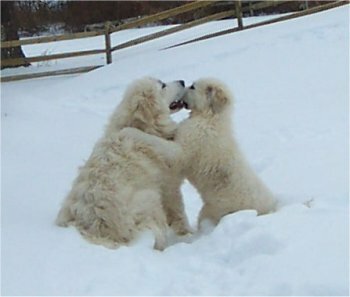 Double coated breeds of dogs may be left outside if they have proper shelter. Dog houses must be insulated and proper bedding must be used. For example use straw, blankets will become wet and cold. As always, prevention is preferable to treatment. Enjoy your winter activities, but be sure that both you and your pet are protected against frostbite and hypothermia. If you have any concerns or questions, please do not hesitate to contact us. The sooner either frostbite or hypothermia are taken care of, the better the outcome may be. This can be done over the course of a few hours or within one day for the majority of dogs. We have all seen the videos of dogs wearing booties, where they flail their legs and act like they can no longer walk. This is a normal behaviour when a dog has booties placed on all four feet for the first time. 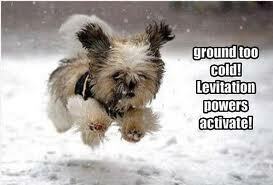 Dogs have feeling in the pads of their feet that allow them to determine the type of surface they are on. By placing boots on their feet we remove this sensation, plus it certainly isn’t common practice for a dog to place a pair of boots on his feet! The best way to prepare your dog for wearing booties is to start by putting a boot on just one foot. 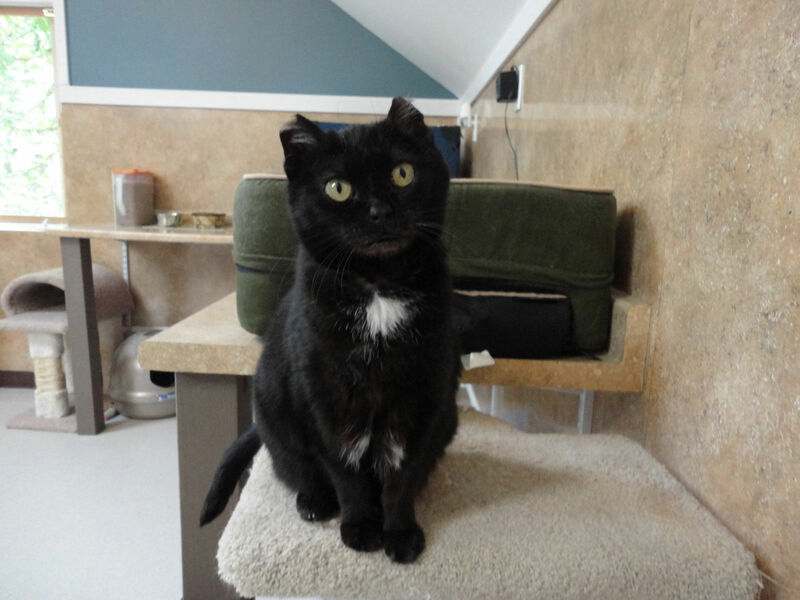 Reward him with treats and give him an opportunity to get use to the sensation on only one foot, while still having normal sensation in the other feet. When he seems ok with that, add one more boot and again reward him with treats, allowing him time to get use to the this second boot. Now take a break. Remove the boots and give your dog a break for a little bit. The next time you go back to putting the boots on start with the 2 you ended with, on the same feet (usually the front). Reward and add the 3rd boot, then the 4th, rewarding all the time. Give him a chance to get use to the sensation and reward him for moving around a little in the house. Again, take a break. Now you are ready to head outside with the booties – with each boot that you place on, reward your dog with a treat and be prepared that today’s walk should be shorter than normal. 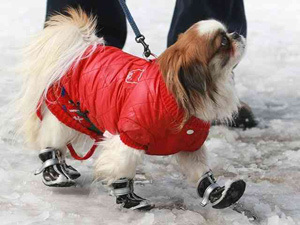 Once your dog gets use to the booties and realizes that his feet aren’t so cold, many dogs will come to love having their boots on when heading out for any winter activities. There are a variety of boots available on the market; some only made of fleece, while others very high-tech, complete with reflective stripping and designed to stay dry. Purchase boots appropriate to what your plans are. If you are only wanting them for when your dog goes out to do his business or for short walks on cold days, fleece boots work great. If you are planning longer walks/hikes or plan to also use them when the weather may be slushy, purchase ones designed to ward off the wet. Be sure to dry booties out between outdoor adventures – turn them inside out and ensure that they are completely dry prior to the next use. Toxic or not so much?